During broadcasts, there are some kind of information that needs to be accessible at all times. The name of the presenter and guests, the name of the company, location amongst other things. The best way to drive focus to relevant information, without sounding repetitive, is to use lower thirds on your live stream. On this article, we cover what lower thirds are and why they are useful to your live streams. Most importantly, you will learn how to add them on your live streams with ease. A lower third is a graphic overlay with text applied on live video to display information that is relevant to the scene. When you are watching an interview and you see an overlay pop up with the name of the person or the location, that’s a lower third. The name refers to the area that it usually is placed on the screen. The lower part of the screen is a title-safe area and it won’t be on the presenter’s face. Some lower thirds are animated and can disappear during the broadcast. Why are graphic overlays useful for live streams? Using lower third is a great way to keep your audience informed without having to repeat the same information. It’s especially useful to present your brand and your name on live streams. Live streams with lower thirds look more professional and gives the presenter credibility. Even though it’s just a text overlay, it can be your great ally on live video because it keeps your audience informed, which keeps them engaged. How to add Lower Thirds to your Live Stream with ManyCam? 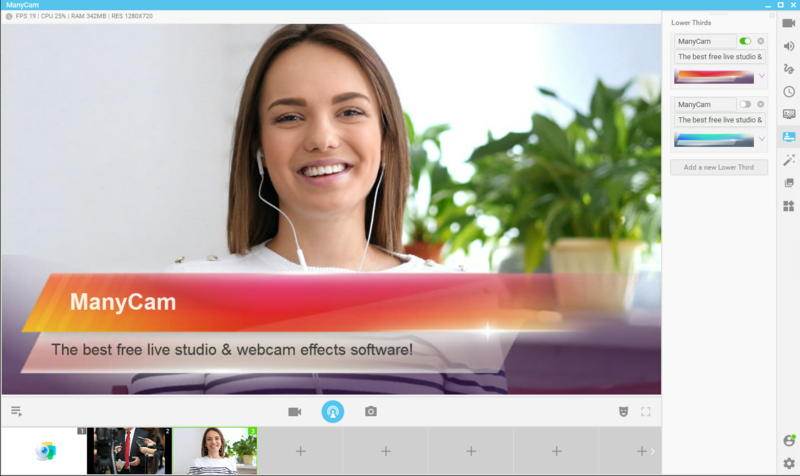 Adding lower thirds to your live streams and video calls is easy with ManyCam 6. On the right-side toolbar, you can find the “Lower Thirds” tab. Unlike previous versions of ManyCam, the lower thirds aren’t just extra effects. They are a complete feature with its own animations and switches. This is important because it makes them look more professional and easier to activate/deactivate. 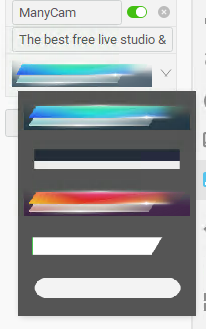 There 5 different graphic overlays for you to choose from and more on the way. Since this is a new feature, users can’t add their own lower thirds yet. Once you click on the “Lower Thirds” tab, you will be able to customize it to your live stream. Enter the title and subtitle you want to display. To edit your lower third, just click on the section you want and make the changes. The changes won’t appear straight away, you’ll need to deactivate and then reactivate it. Here, you can create as many lower thirds as you want for your live video. During your broadcast, you can activate them as you go. It’s great way to be prepared for live streams with more than one speaker. Preparing lower thirds can also improve your video conferences. Pick relevant information to put on your lower thirds such as your name, your brand’s name or location, titles etc. Once you have the right information, get ready to display them on your stream. 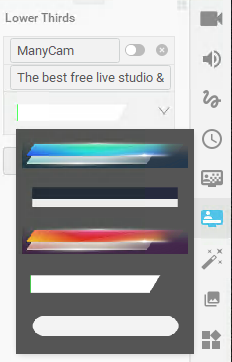 To give your viewers a great experience on your live stream, you should turn these overlays off and on, instead of keeping them on screen at all times. Lower thirds on live streams can drive your audience’s focus and keep them engaged. With the amount of distractions people are facing today, anything that can help keep viewers with us, is welcome. Before your next live stream, create relevant lower thirds and get your audience’s attention.